The psychological benefits of sports in children are numerous. These range from providing them with a better understanding of social dynamics to helping them channel school-related stress. Today we'll tell you more about these multiple benefits. There are numerous psychological benefits of sports, especially for children. It’s common knowledge that participating in sports from a young age helps combat a sedentary lifestyle and stimulate motricity. Children who participate in sports also tend to be more disciplined and happy. They learn faster and adapt better to society. It’s important for parents to be aware of the many psychological benefits of sports. 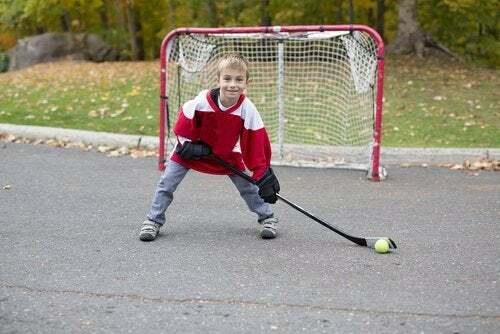 This knowledge will help you guide your little ones to practice whatever sport draws their attention. All medical specialists agree that sports and physical exercise boost overall well-being. They not only serve as excellent recreational activities, but also stimulate cognitive functions and respect for rules. Sports produce and require increased cognitive activity, which is, without a doubt, a fundamental advantage. Children who participate in sports demonstrate the ability to memorize more, and better. At the same time, they’re more able to retain information than sedentary children. While exercising, children experience an increase in cell production in the hypothalamus – the part of the brain that’s responsible for controlling the autonomic nervous system and the endocrine system. In adults and children alike, studies have shown that physical activity contributes to an overall sense of well-being. This is because our bodies release endorphins when we’re physically active. Children who take part in sports suffer less stress and are less prone to depressive states. In the same way, specialists widely recommend that hyperactive children take part in sports and physical activity. The same is true for little ones who are impulsive or display violent attitudes. Being active allows them to burn off their energy and reduce their anxiety. Another one of the psychological benefits of sports is allowing children to socialize and work as a team. Both skills are fundamental, and children don’t always learn them through school and other activities. However, when they share common goals and interests with their peers, they learn the importance of working together. At the same time, sports also help children take in knowledge about rules and norms from a different perspective. They do it in a practical way, and learn first hand about injustice. Sports help children learn how necessary it is to apply and respect the rules. As a result, children will be less resistant to rules at home, school, etc. Children who practice sports in athletic institutions, gyms and clubs have the advantage of a wider social group and friends. This allows them to learn to relate to others in diverse social spheres. It also broadens their mentality and perception, leading to a deeper understanding of diverse individuals in society. The triumphs related to sports are also an important factor in solidifying a child’s self-esteem. Exercise leads to strong, toned muscles and good physical appearance in general. Both of these factors make children feel more confident, less shy, and more comfortable with their bodies. At the same time, children develop an interest in eating well and caring for their health. Physical activity activates the brain and causes it to produce more neurons. It also strengthens the connection between them. This cerebral phenomenon, known as neurogenesis, is extremely beneficial to our bodies. When children’s neurons multiply and their connections strengthen, they acquire a greater capacity to make rapid decisions. They also become capable of following logical thought and less prone to distraction. This translates to an increase in intelligence. In general, children who take part in sports also develop a healthier lifestyle overall. For example, they tend to have better hygiene, bathe more often, and cut their nails more regularly. At the same time, they’re more prone to stay away from fatty foods. They tend to be more conscious of what time they go to bed and of getting enough sleep at night. Children who take part in sports are often better at fulfilling obligations within the stipulated times. As a final recommendation, we recommend allowing your children to choose which sport (or sports) they want to practice. Children will receive less psychological benefits of sports if they’re forced to play and join a team, rather than choose to on their own. The same is true if we demand too much from our children when it comes to sports. It’s best to use common sense, care, and understanding.